Suppose someone claimed to have discovered a secret code in one of the most wildly popular children’s series in the latter half of the twentieth century. Moreover, suppose that this person claimed the code would unlock the architectonic structure of a series that, while certainly a modern classic, has often been accused of being written in a bit of a slapdash manner, with no clear guiding principle. Then suppose that our interpreter further claimed that the author of the series intentionally used this code, but kept it a secret, only to be “discovered” nearly half a century after the author’s death. You would think this guy was crazy, no? 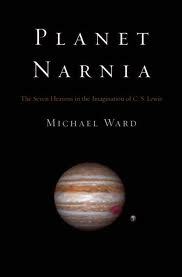 These are precisely the claims that Michael Ward makes in his recent study of the Chronicles of Narnia, Planet Narnia: The Seven Heavens in the Imagination of C. S. Lewis. Want to hear the most outrageous part? He actually pulls it off! Words fail to express the genius of this work, which originated as a doctoral thesis at the University of St. Andrews in Scotland. Ward’s claim at first appears audacious, bordering on absurd. The argument can be summed up briefly: each of the seven books in the Narniad (the scholarly term for the series) reflects the characteristics of one of the seven heavenly spheres of medieval cosmology (Jupiter, Mars, Sol, Luna, Mercury, Venus, and Saturn). Not only does each book reflect one of these spheres, though; each one actually embodies the spirit of the planet, from beginning to end. The characters, the plot, the imagery of each book – all of these combine to establish an overall Gestalt corresponding to the book’s planetary symbol. To take just one example, The Lion, the Witch, and the Wardrobe, the first book in the series, is imbued with the characteristics of Jupiter. It is a Jovial book filled with kingly features, joyfulness, feasting, and the passing from winter into spring. Aslan embodies many of these features, but so, in their own way, do the four Pevensie children, as do other characters and the very plot of the story. This Jovial character explains appearances that have seemed anomalies to most interpreters. Many critics, for example, argue that Father Christmas is out of place in Narnia and so was simply a blunder on Lewis’s part. Narnia was a mishmash of various mythologies carelessly cobbled together (this was J. R. R. Tolkien’s famous criticism of the book). Ward argues that the Jovial theme explains the appearance of Father Christmas: rather than an oddity or an incongruity, Father Christmas appears because he is the quintessential Jovial character in modern culture – both in the sense of jocularity, and in the sense of reflecting this and other characteristics of Jove, king of the gods. The lion’s share of Ward’s book interprets each of the Chronicles along these lines. Ward does not confine himself to the Chronicles, though. In each chapter he also discusses the significance of one of the planetary spheres in Lewis’s scholarship, in his poetry, and in the space trilogy (the other work obviously influenced by Lewis’s fascination with medieval cosmology) before turning to the Chronicle that embodies the sphere. With each successive chapter, the case becomes stronger and stronger, such that by the end the reader can’t help but agree with Ward that his discovery of the schema is definitive – not in the sense of closing off discussion, but in the sense of explaining the fundamental guiding principle behind the series. Ward does more than offer a fascinating literary analysis, however. He also opens a window onto Lewis’s genius, his broadmindedness, and his playfulness. His thesis shows numerous connections between Lewis the scholar, Lewis the poet, and Lewis the storyteller. Lewis lived and breathed medieval culture, and he synthesized it in a stunning way. Moreover, Ward demonstrates the capaciousness of Lewis’s Christianity. Like his medieval hero Dante (and the medieval spirit in general), Lewis did not disdain all things pagan, but rather intentionally drew upon the good, the true, and the beautiful in pagan mythology. In short, he baptized the pagan gods and used them to represent different aspects of the Christian God he had come to worship. Finally, the fact that Lewis could use such a schema and yet keep it a secret suggests an endearing puckishness on his part. Ward suggests that one of the reasons Lewis may have kept the schema a secret was to see if anyone would get it. The joke paid off, as it took nearly fifty years for someone to get it. Planet Narnia is a breathtaking work. It opens new vistas on this modern classic, and it deserves to become a classic itself. I have long been a fan of both Lewis and Tolkien, but I always considered the latter’s Middle Earth the superior achievement. While my loyalty still lies with Tolkien, Ward has convinced me that Lewis’s Narniad is no less spectacular. For any serious fan of Lewis and of the Chronicles, Planet Narnia is an absolute must-read. Seventeen down, (at least) thirty-five to go. P.S. If you are a bit daunted at the prospect of tackling a work that began as a doctoral thesis, Ward has also published a more popular version of the work, The Narnia Code (also available on DVD). Thank you for your reviews. You’ve already added several books to my seemingly endless list of books I have to read. This latest seems very interesting as well. I too am a Tolkien fan. I only just read Lewis’ Narnia books right before the movies came out (believing that to be the proper order of things), but have loved Middle Earth since I was a boy. Part of the fascination with Tolkien was the constant feeling that there was always more to the story – a back story, endless opportunity for further delight. If the author has in fact discovered an overarching theme in Narnia, however, what wonderful worlds of discovery await there as well?! I’ve noted also that several of your posts concern educational matters (all of which interest me) and I would like to make one book suggestion for you. Diane Ravitch’s “Left Back: A Century of Battles Over School Reform” is , I believe, an excellent history of education in the United States which, for me, very clearly explains our nation’s current educational predicament. It is, unfortunately, a fairly lengthy book and may not serve the purposes of your endeavor here. Glad you’re enjoying the reviews. Yes, on Ward’s reading, there is a whole lot of depth in the Narnia books. I’m very tempted to go back and re-read them all right away, but I think I may put it off for now – too many other things that I haven’t yet read to get to. Thanks for the book rec. My purpose here is to read books that are worth reading, and so I welcome suggestions. The timing of your recommendation is kind of funny, in that Ravitch was on The Daily Show the other night talking about her new book criticizing the use of testing. From our library catalog, it looks like she has a lot of interesting books. I’ll have to look into it.